Sweet potatoes are a member of the Convolvulaceae family. This starchy yet sweet tasting root is quite large and moist with a bright orange flesh. Sweet potatoes have been used as a food source for as many as 5000 years because they are quite versatile. People who are dieting enjoy this food because it contains many healthy ingredients and a sweet taste but very few calories. Sweet potatoes can easily be added to a variety of dishes to increase the flavor without having to increase the calorie content. But how many calories are there in a sweet potato? What exactly are the health benefits? How to prepare low-calorie sweet potato? Sweet potatoes are often praised for being a prime source of vitamin A, vitamin C and beta carotene. They are also packed with copper, manganese, vitamin B6, dietary fiber, starch, protein, complex carbohydrates, iron, calcium and potassium. Sweet potatoes have the lowest glycemic index rating for a root vegetable, offering a sweet taste along with slowly-digested fibers. This means that the blood sugar is raised slowly after you consume a sweet potato so you will feel full for a longer period of time. The carbohydrates in a sweet potato are considered "good carbs" so they can help to stabilize the blood sugar which is ideal for those trying to manage diabetes. Beta Carotene and Vitamin A. Sweet potatoes have almost four times your daily recommended value of vitamin A and beta carotene. These ingredients help to maintain bone development, vision and immune health. Adding a bit of fat to a sweet potato such as a small amount of butter will help you absorb these nutrients more efficiently. Vitamin C. Sweet potatoes contain around 35 percent of your daily value of vitamin C, which helps the body maintain their immune system. Vitamin C is also necessary to allow the body to absorb iron properly. Manganese. The high amount of manganese in sweet potatoes helps the body maintain optimal thyroid function and ideal blood sugar levels. Fiber. Sweet potatoes are high in fiber which allows the body to feel full for a longer period of time while lowering cholesterol and allowing for healthier bowel movements. One baked medium-sized sweet potato with the skin on contains as much as 4 grams of fiber. Complex Carbohydrates. Sweet potatoes contain complex carbohydrates that are released into the body at a slower rate. This allows the body to maintain a higher energy level for a longer period of time without the worry of feeling a crash or sugar low later. Antioxidants. The nutrients in sweet potatoes contain a high amount of antioxidants that can help the body avoid chronic diseases such as cardiovascular disease or cancer. 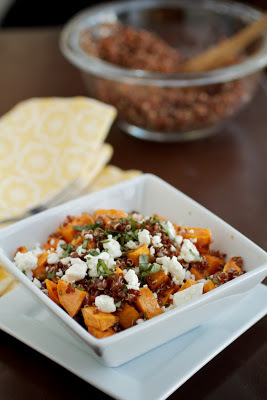 Ingredients: A medium sized sweet potato, a cup of water, 1/2 cup quinoa, a tablespoon olive oil, two tablespoons fresh basil, salt and pepper to taste, 1/4 cup feta. Peel and dice the sweet potato into half inch cubes and coat them in the olive oil, salt and pepper. Spread the cubes on a baking tray lined with tin foil and bake for 24-35 minutes or until they are tender and golden brown. In the meantime, rinse the quinoa and place it in a pot with the water. Simmer the quinoa for 15 minutes or until tender. Combine the roasted sweet potatoes with the quinoa and mix in the feta and julienned basil with an additional half tablespoon olive oil. Ingredients: 2 medium sweet potatoes, 2 tablespoons sugar, 1.5 cups flour, 1 teaspoon cinnamon, 3 tablespoons baking powder, ½ teaspoon salt, ½ teaspoon nutmeg, 1.5 cups buttermilk, whole milk or half and half, 2 teaspoons melted butter, 2 eggs. Coat the outside of the sweet potatoes in olive oil and wrap each in tin foil, placing them in a baking tin. Bake the potatoes for 45-60 minutes or until they are tender. Combine the baking powder, flour, sugar, cinnamon, salt and nutmeg in a bowl. Combine the eggs, butter and milk in a different bowl and whisk into the dry ingredients. Peel and mash the sweet potatoes and fold ¾ of the mixture into the pancake batter. Butter a pan and warm it over medium heat. Pour approximately ¼ of your batter into the pan and allow it to cook until it bubbles before flipping. This should take around 3-4 minutes. Repeat the process until you have used all of the batter. 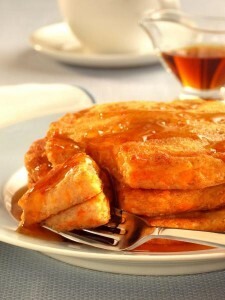 Serve the pancakes with maple syrup and the remaining sweet potatoes.